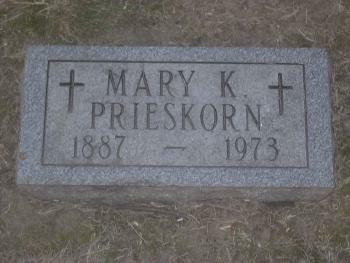 Married Name 1908 As of 1908,her married name was Prieskorn. Mary K. Altheide was born on 11 October 1886 at Illinois tombstone lists birth year as 1887. She was the daughter of Henry Altheide and Hannah C. Feldkamp. Mary K. Altheide married Edward Gus Prieskorn, son of Charles Prieskorn and Louise Carolina Adolphina Marie Arndt, in 1908 at Adams, Illinois. She was buried on 29 March 1973 at Greenmount Cemetery, Quincy, Adams, Illinois. Mary K. Altheide had zero children. She obtained US Social Security Card at Michigan; last residence Detroit, Wayne, Michigan. [S326] Michigan Deaths, 1971-1996 (published). [S245] U.S. Federal Census 1900 U.S. Federal Census, by Ancestry.com, Year: 1900; Census Place: Quincy Ward 2, Adams, Illinois; Roll: 236; Page: 12A; Enumeration District: 0125; FHL microfilm: 1240236. [S244] U.S. Federal Census 1910 U.S. Federal Census, by Ancestry.com, ED37. Dwelling 154. [S243] U.S. Federal Census 1920 U.S. Federal Census, by Ancestry.com, ED535. Dwelling 64. [S250] U.S. Federal Census 1930 U.S. Federal Census, by Ancestry.com, ED82-759. Dwelling 372. [S373] U.S. Federal Census 1940 U.S. Federal Census, by Ancestry.com, Year: 1940; Census Place: Detroit, Wayne, Michigan; Roll: T627_1880; Page: 2A; Enumeration District: 84-1343. (?) Smith was born at Missouri. Effie M. Smith was born circa 1916 at Missouri. She was the daughter of (?) Smith. [S250] U.S. Federal Census 1930 U.S. Federal Census, by Ancestry.com, ED19-27. Dwelling 34. John Watson Graham was born on 10 November 1877 at Arkansas. He was the son of George W. Graham and Harriet Jane Tanner. John Watson Graham died on 19 June 1880 at age 2. He was buried after 19 June 1880 at Lisbon Cemetery, Union, Arkansas. [S246] U.S. Federal Census 1880 U.S. Federal Census, by Ancestry.com, ED277. Dwelling 158. Name Variation Penina Lassiter was also known as Permina. Name Variation Penina Lassiter was also known as Lasiter. Married Name before 1855 As of before 1855,her married name was Lee. Married Name after 1862 As of after 1862,her married name was Peters. Married Name 8 February 1872 As of 8 February 1872,her married name was Tanner. Penina Lassiter was born in April 1838 at Alabama also reported as about 1834; tombstone lists birth as 1849. She was the daughter of Jason Lassiter and Thena H. Cotton. Penina Lassiter married William Joel Lee before 1855. Penina Lassiter married George R. Peters after 1862. Penina Lassiter died in 1919. She was buried in 1919 at Lisbon Cemetery, Union, Arkansas. In Levi Tanner's will dated 6 August 1896 at Union, Arkansas, Penina Lassiter was named as an heir. She had 4 with 2 living in 1900 children. She had 4 with 1 living in 1910 children. [S262] Arkansas Union County Marriage Listings, by Ancestry.com, Book C. Page 300D. [S249] U.S. Federal Census 1850 U.S. Federal Census, by Ancestry.com, Stamp 237. Dwelling 1382. [S248] U.S. Federal Census 1860 U.S. Federal Census, by Ancestry.com, Page 33. Stamp 243. Dwelling 225. [S247] U.S. Federal Census 1870 U.S. Federal Census, by Ancestry.com, Stamp 570. Page 33. Dwelling 256. [S246] U.S. Federal Census 1880 U.S. Federal Census, by Ancestry.com, ED277. Dwelling 1. [S245] U.S. Federal Census 1900 U.S. Federal Census, by Ancestry.com, ED131. Dwelling 201. [S244] U.S. Federal Census 1910 U.S. Federal Census, by Ancestry.com, ED139. Dwelling 59. Name Variation William Joel Lee was also known as W. J.
William Joel Lee was born circa 1829 at Conecuh, Alabama. He married Penina Lassiter, daughter of Jason Lassiter and Thena H. Cotton, before 1855. William Joel Lee died on 3 July 1863 at killed at the Battle of Gettysburg. Enlisted in the Confederate Army. William T. Lee was born circa 1862 at Arkansas. He was the son of William Joel Lee and Penina Lassiter. William T. Lee died before 1910. George R. Peters married Penina Lassiter, daughter of Jason Lassiter and Thena H. Cotton, after 1862. George R. Peters died before 1870. Name Variation Albert Oliver Peters was also known as A. O.
Albert Oliver Peters was born on 11 October 1865 at El Dorado, Union, Arkansas. He was the son of George R. Peters and Penina Lassiter. Albert Oliver Peters died on 26 May 1916 at Arkansas at age 50. Name Variation George Washington Smith was also known as G. W.
George Washington Smith was born circa 1818 at Racoon, Gallia, Ohio. He was the son of George Smith and Elizabeth (?). George Washington Smith married Martha Calhoun on 26 December 1838 at Gallia, Ohio. George Washington Smith married Sarah Shoemaker on 30 January 1844 at Raccoon, Gallia, Ohio. George Washington Smith married Susan L. Hollaway on 4 February 1872 at Cass, Missouri. George Washington Smith died on 15 December 1894 at West Dolan, Cass, Missouri. [S249] U.S. Federal Census 1850 U.S. Federal Census, by Ancestry.com, Dwelling 1002. [S248] U.S. Federal Census 1860 U.S. Federal Census, by Ancestry.com, Page 155-156. Dwelling 1053. [S247] U.S. Federal Census 1870 U.S. Federal Census, by Ancestry.com, Year: 1870; Census Place: Pleasant, Poweshiek, Iowa; Roll: M593_417; Page: 361B; Family History Library Film: 545916. Married Name 30 January 1844 As of 30 January 1844,her married name was Smith. Sarah Shoemaker was born circa 1823 at Ohio. She married George Washington Smith, son of George Smith and Elizabeth (? ), on 30 January 1844 at Raccoon, Gallia, Ohio. Sarah Shoemaker died circa 1870 at Iowa. Jacob Shoemaker Smith was born circa 1849 at Pulaski, Illinois. He was the son of George Washington Smith and Sarah Shoemaker. 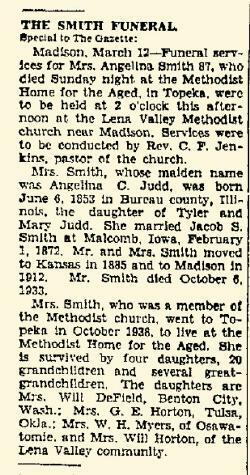 Jacob Shoemaker Smith married Angeline Cordelia Judd, daughter of Tyler Judd and Mary Angeline Gove, on 1 February 1872 at Malcom, Poweshiek, Iowa. Jacob Shoemaker Smith died on 6 October 1932 at Lena Valley, Greenwood, Kansas, also reported as 06 Oct 1933. He was buried after 6 October 1932 at Lena Valley Cemetery, Lena Valley, Greenwood, Kansas. [S246] U.S. Federal Census 1880 U.S. Federal Census, by Ancestry.com, NA Film Number T9-0389 Page Number 499C. [S243] U.S. Federal Census 1920 U.S. Federal Census, by Ancestry.com, ED31. Dwelling 43. [S250] U.S. Federal Census 1930 U.S. Federal Census, by Ancestry.com, ED37-12. Dwelling 35. Name Variation Mary Louvisa Smith was also known as Lou. Married Name 1 January 1875 As of 1 January 1875,her married name was Judd. Mary Louvisa Smith was born on 12 March 1855 at Galesburg, Knox, Illinois. She was the daughter of George Washington Smith and Sarah Shoemaker. 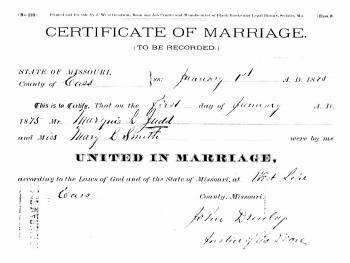 Mary Louvisa Smith married Marquis Lafyette Judd, son of Tyler Judd and Mary Angeline Gove, on 1 January 1875 at Cass, Missouri. Mary Louvisa Smith died on 8 December 1934 at La Junta, Colorado, at age 79. [S246] U.S. Federal Census 1880 U.S. Federal Census, by Ancestry.com, ED137. Page 13. Dwelling 95. [S250] U.S. Federal Census 1930 U.S. Federal Census, by Ancestry.com, ED96-5. Dwelling 53. George Riley Smith was born on 20 June 1857 at Pulaski, Illinois. George Riley Smith married Harriet Jane Crotchett, daughter of Thomas Crotchett and Martha Susan Tanner, on 12 October 1881 at Louisburg, Miami, Kansas. George Riley Smith died on 15 March 1905 at Lena Valley, Greenwood, Kansas, at age 47. 1 March 1895 Shell Rock, Greenwood, Kansas George Riley Smith appeared on the census of 1 March 1895 at Shell Rock, Greenwood, Kansas. Name Variation Ida M. Smith was also known as Irene M.
Name Variation Ida M. Smith was also known as Inna. Ida M. Smith was born circa 1864 at Pulaski, Illinois. Name Variation Angeline Cordelia Judd was also known as Amelia C.
Name Variation Angeline Cordelia Judd was also known as Angeline Amelia Cordelia. Married Name 1 February 1872 As of 1 February 1872,her married name was Smith. Angeline Cordelia Judd was born on 6 June 1853 at Bureau, Illinois. She was the daughter of Tyler Judd and Mary Angeline Gove. Angeline Cordelia Judd married Jacob Shoemaker Smith, son of George Washington Smith and Sarah Shoemaker, on 1 February 1872 at Malcom, Poweshiek, Iowa. Angeline Cordelia Judd died on 9 March 1941 at Madison, Greenwood, Kansas, at age 87 Angelina (Judd) Smith obituary. [S248] U.S. Federal Census 1860 U.S. Federal Census, by Ancestry.com, Year: 1860; Census Place: La Moille, Bureau, Illinois; Roll: M653_158; Page: 284; Family History Library Film: 803158. [S247] U.S. Federal Census 1870 U.S. Federal Census, by Ancestry.com, Page 4. Dwelling 21. Married Name Her married name was Steinbrenner. Tillie Hasz was born in 1912 at Wisconsin. She was the daughter of August W. Hasz and Emilie Johanna Thieding. (?) Thieding was the son of (?) Thieding. John Thieding married Maria (?). John Thieding was born in 1856 at Germany. He was the son of (?) Thieding. John Thieding died in 1944. [S243] U.S. Federal Census 1920 U.S. Federal Census, by Ancestry.com, ED171. Dwelling 139. [S250] U.S. Federal Census 1930 U.S. Federal Census, by Ancestry.com, ED56-22. Dwelling 65. Name Variation Henry Christian Buelow was also known as Heinrich. Name Variation Henry Christian Buelow was also known as Henry F.
Henry Christian Buelow was born in 1886 at Wisconsin. He was the son of Friderich J. Buelow and Albertine (?). Henry Christian Buelow died in 1950. Name Variation Rosella Emilie Anna Buelow was also known as Rosella A. Married Name 21 April 1936 As of 21 April 1936,her married name was Kleatsch. Rosella Emilie Anna Buelow was born on 29 December 1913 at Wisconsin. She was the daughter of Henry Christian Buelow and Anna Hasz. Herman Heinz married Emma Hasz, daughter of Henry William Hasz and Amelia Johanna Giese. Herman Heinz was born in 1888. Married Name 6 October 1926 As of 6 October 1926,her married name was Hasz. Edna Viola Meyer was born on 23 August 1901 at Wisconsin. She married William Henry Hasz, son of Henry William Hasz and Amelia Johanna Giese, on 6 October 1926 at Illinois. Edna Viola Meyer died on 25 January 1995 at Dane, Wisconsin, at age 93. Edna Viola Meyer obtained US Social Security Card at Wisconsin; last residence Madison, Dane, Wisconsin. On 5 November 1939 at Mr and Mrs Albert Hasz 25th wedding anniversary. Name Variation Mary E. Schenkat was also known as Schenkatt. Name Variation Mary E. Schenkat was also known as Marie. Married Name 6 January 1921 As of 6 January 1921,her married name was Hasz. Mary E. Schenkat was born in September 1895 at North Freedom, Sauk, Wisconsin. She was the daughter of William Schenkat and Marie Elizabeth Voss. Mary E. Schenkat married Edward F. Hasz, son of Henry William Hasz and Amelia Johanna Giese, on 6 January 1921 at North Freedom, Sauk, Wisconsin. Mary E. Schenkat died in 1971. [S245] U.S. Federal Census 1900 U.S. Federal Census, by Ancestry.com, ED135. Dwelling 283. [S244] U.S. Federal Census 1910 U.S. Federal Census, by Ancestry.com, ED125. Dwelling 21. Married Name 19 June 1898 As of 19 June 1898,her married name was Kruse. Augusta W. Giese was born on 31 December 1871 at Germany. She was the daughter of August Erdman Giese and Wilhelmina Remtar. Augusta W. Giese married Heinrich Nicholas Kruse, son of Herman W. Kruse and Anna Christina Luehrsen, on 19 June 1898 at St. Peter's Lutheran Church, Loganville, Sauk, Wisconsin. Augusta W. Giese died on 21 July 1957 at Reedsburg, Sauk, Wisconsin, at age 85. Augusta W. Giese immigrated with Wilhelmina Remtar and August Erdman Giese in 1872. [S246] U.S. Federal Census 1880 U.S. Federal Census, by Ancestry.com, NA Film Number T9-1446 Page Number 282C. [S243] U.S. Federal Census 1920 U.S. Federal Census, by Ancestry.com, ED171. Dwelling 142. Name Variation Heinrich Nicholas Kruse was also known as Henry. Heinrich Nicholas Kruse was born on 10 May 1856 at New York also reported as Germany. He was the son of Herman W. Kruse and Anna Christina Luehrsen. Heinrich Nicholas Kruse married Augusta W. Giese, daughter of August Erdman Giese and Wilhelmina Remtar, on 19 June 1898 at St. Peter's Lutheran Church, Loganville, Sauk, Wisconsin. Heinrich Nicholas Kruse died in 1935. [S246] U.S. Federal Census 1880 U.S. Federal Census, by Ancestry.com, NA Film Number T9-1446 Page Number 285B. Herman Giese was born on 12 July 1875 at Sauk, Wisconsin. He was the son of August Erdman Giese and Wilhelmina Remtar. Herman Giese and Ella Emma Hanusa were divorced before 1940. Herman Giese died in 1948. [S245] U.S. Federal Census 1900 U.S. Federal Census, by Ancestry.com, ED149. Dwelling 190. [S364] Wisconsin State Census Wisconsin State Censuses, 1895 and 1905, by Ancestry.com, Dwelling 79. [S244] U.S. Federal Census 1910 U.S. Federal Census, by Ancestry.com, ED130. Dwelling 59. Married Name 28 September 1910 As of 28 September 1910,her married name was Giese. Ella Emma Hanusa was born on 23 March 1891 at Wisconsin. Ella Emma Hanusa and Herman Giese were divorced before 1940. Ella Emma Hanusa died on 7 July 1973 at age 82. [S273] Wisconsin Sauk County, Wisconsin Cemetery Records, page 106. [S244] U.S. Federal Census 1910 U.S. Federal Census, by Ancestry.com, ED130. Dwelling 148. [S373] U.S. Federal Census 1940 U.S. Federal Census, by Ancestry.com, Year: 1940; Census Place: Reedsburg, Sauk, Wisconsin; Roll: T627_4523; Page: 4B; Enumeration District: 56-33. Married Name 1 October 1931 As of 1 October 1931,her married name was Racek. Esther Giese was born on 5 January 1911. She was the daughter of Herman Giese and Ella Emma Hanusa. Esther Giese married Frank Racek, son of Joseph Racek and Emilie Radous, on 1 October 1931 at Chicago, Cook, Illinois. Esther Giese died on 2 July 1997 at age 86. Esther Giese obtained US Social Security Card at Wisconsin; last residence Sauk City, Sauk, Wisconsin.